Championships are said to be won on the defensive end, but if your team isn't able to knock down open jump shots, you'll have a hard time reaching your ultimate goal. This video packed with shooting drills from the best coaches and programs in the country gives you all the tools necessary to address this issue. To become a better shooter, an appropriate warm-up is a must. Fred Hoiberg introduces the warm-up he did as a player starting from his days playing youth basketball to the end of his career in the NBA. Coach Hoiberg starts close to the basket and moves out as he starts to increase his range while maintaining his shooting form. Phil Martelli shows a warm-up drill that is designed to work on shooting from the side. This drill can be done in a practice format with four players on a basket shooting two basketballs. The drill moves to the "game spot," an area where players shoot from most often. One of the best shooters ever, Rick Barry, demonstrates fundamentals for the jump shot. An all-time great shooter, Barry discusses how to shoot the basketball using the right form and mechanics, especially the concept of shooting the basketball "up to the basket." 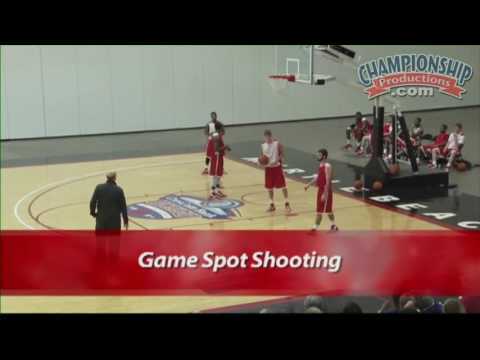 Terry Layton presents a shooting drill that he learned from the Brazilian national team. This drill incorporates cutting, passing, catching, and outside shooting. John Tauer covers three keys to shooting: the ball going straight, the ball going up, and the ball going the correct distance. 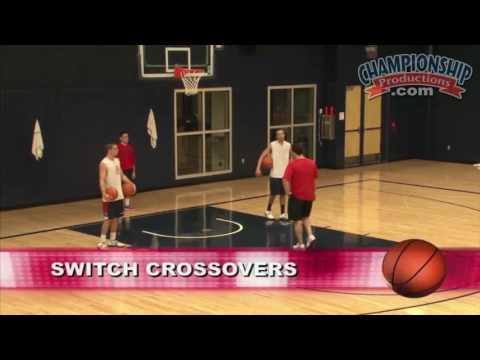 Chris Collins presents a transition shooting drill that is designed to work on getting players to shoot on the move. The drill emphasizes footwork and finishing lay-ups against contact. The drill then progresses to making a pull-up jump shot. Steve Alford teaches how to catch and shoot on the move. Using tight cuts, pop cuts, and flare cuts off the catch, Coach Alford's drill places an emphasis on executing game shots at game speed while developing footwork. Kevin Eastman demonstrates the McHale Drill. This chair drill teaches the mid-range jump shot and scoring the basketball off of a rebound. Many top coaches feel assists are one of the most important stats related to winning. Assists reflect a team's ability to take advantage of multiple threats and to place players in a position to score. Getting the ball to the right player at the right time is a vital key to victory, especially in a close game. This video takes you inside the practice sessions of top coaches and trainers to show you how to improve your team's passing abilities. With an amazing diversity of drills that work on catching, bounce passing, outlet passing and more, this video will give you a wide variety of drills to choose from to increase your team's offensive efficiency. Kevin Boyle begins with a pair of warm-up drills designed to work on passing and movement. The first works with v-cuts and perimeter player exchanges. The second utilizes shots fakes, middle drives, baseline drives, and drift passes to the corner. To develop the fast break, Tom Izzo uses a three-player drill, starting with a rebound and outlet pass by a post player, to focus on finding transition jumpers and mid-line hunters while advancing the ball as much as possible on each pass. In working with post players, Gregg Marshall profiles a drill designed to simulate rebounding and making the outlet pass. Coach Marshall emphasizes blocking out a would-be rebounder, rebounding the ball at its apex with two hands, and making the outlet pass to the correct side of the floor. Bob Hurley introduces an outlet passing drill used at the start of his team's practices. Working in pairs and using both ends of the court, one player will throw the ball off the backboard and rebound the ball with two hands before making the outlet pass. The player receiving the outlet pass will dribble down the court and get to the middle of the floor before making a jump stop inside the free throw circle and passing to the rebounder who runs wide and to the outside. Ball handling is the first building block of creating an offense that is able to minimize turnovers and maximize the value of each possession. This video combines some of the best lessons and drills from some of Championship Production's best selling coaching videos. It's a virtual encyclopedia of ball handling drills for every situation; whether it's breaking full court pressure, setting up defenders, or finishing at the rim. With over two hours of solid instruction - no filler here - each segment gets right to the point and shows players and coaches demonstrating each drill. Seth Greenberg introduces a warm-up drill that is designed to improve dribbling skills with both hands. This 4-minute daily drill at the start of practice works on being able to execute a variety of dribbling actions that translate into game situations with either hand. Another two-ball warm-up drill presented by Lyndsey Fennelly works on developing the ability to face up when dribbling by working on dribbling two basketballs and going between the legs. Kermit Davis uses a heavy basketball for his Heavy Ball Pound. This drill requires the player to dribble a heavy basketball and execute basic dribble moves to develop hand-eye coordination and strength. To improve dribbling in an open court situation, Tom Izzo demonstrates his Open Court drill. This full-court drill sets up situations where a player must be able to dribble forward and backward before exploding to the other end of the court and finishing with a lay-up. Steve Alford introduces a basic drill that works on figure-eight dribbling and weaving with the dribble. The Ball Cone Drill can be used at different skill levels and with a variety of dribble moves.